Want to thrill the lemon cake lovers? Here's a good bet: lemony mini cupcakes with lemony cream cheese frosting. Beat first 5 ingredients in large bowl with mixer until blended. (Batter will be thick.) Spoon into 36 paper-lined mini muffin cups. Bake 20 to 24 min. or until toothpick inserted in centres comes out clean. Cool in pans 10 min. Remove to wire racks; cool completely. Beat cream cheese, butter, drink mix and milk in large bowl with mixer until blended. Gradually beat in sugar; spread onto cupcakes. Sprinkle with coconut. With their built-in portion control, these miniature cupcakes allow you to easily enjoy a serving of these sweet treats on occasion. 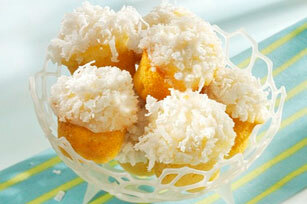 For extra lemony flavour, add the zest of 1 lemon to the cake batter before spooning into prepared muffin cups.